In foreign policy, Gorbachev started disarmament policies and stop participation in conflicts in Africa and Afghanistan. In domestic policy, he introduced perestroika or reforms to democratized politics and liberalized economy. These reforms had opposition from the radical reformers led by Boris Yeltsin who became president of the Russian Federation in 1990 and the radical communists who claimed the reforms will destroy the communism. In 1991 Gorbachev gave autonomy to the Eastern European countries. A military coup was controlled by Boris Yeltsin. From that moment reforms accelerated. The Communist Party was banned, the Baltic Republics (Estonia, Latvia and Lithuania) became independent. Gorbachev resigned and the Soviet Union was dissolved and replaced by the Commonwealth of Independent States formed by the Russian Federation and 11 former soviet republics. The European people´s republics began reform processes to end with the communism and transition to democracy while USSR was facing the recession. This process is known as the Autumn of Nations and was peaceful. Romania Poland, Hungary, Bulgaria, Czechoslovakia and German Democratic Republic took advange of URSS internal problems. 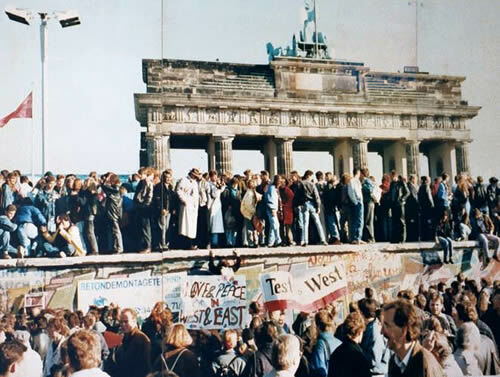 The fall of Berlin Wall which was a symbol of European division on November 1989 led to the German reunification in October 1990.